The very stylish Café Blu opens its doors at 9am and is busy from the outset, with people dropping in for coffee and Danish. 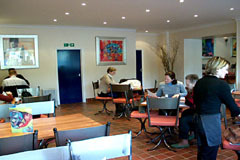 Food is served throughout the day and evening, closing around midnight. Lunchtime starts early with some customers looking to get in before the bustling lunch rush and goes on well into the afternoon with others finding late lunches more convenient. Serving Modern British cuisine with European influences to a high standard, the restaurants attract customers from a wide area. For information on our Windsor restaurant, click on the web link beneath our address. A gourmet take-away menu is available together with a buffet service for homes and offices. Private rooms are available for parties and corporate entertaining with dinner & dance if required. The �open all hours� concept is hugely popular with locals who can drop in at any time during the day for a light meal, something special for foodies, or simply a drink. Open every day 9am-midnight. All major credit cards accepted (not Diners). No service charge except for parties of 5 or more (10%). A truly eclectic menu of the best of Modern British and European cuisine.